I could start a rant, I really could, and go ballistic but why waste energy on stupidity. Which, BTW, starts with the decision to hold a race in a shipping channel. 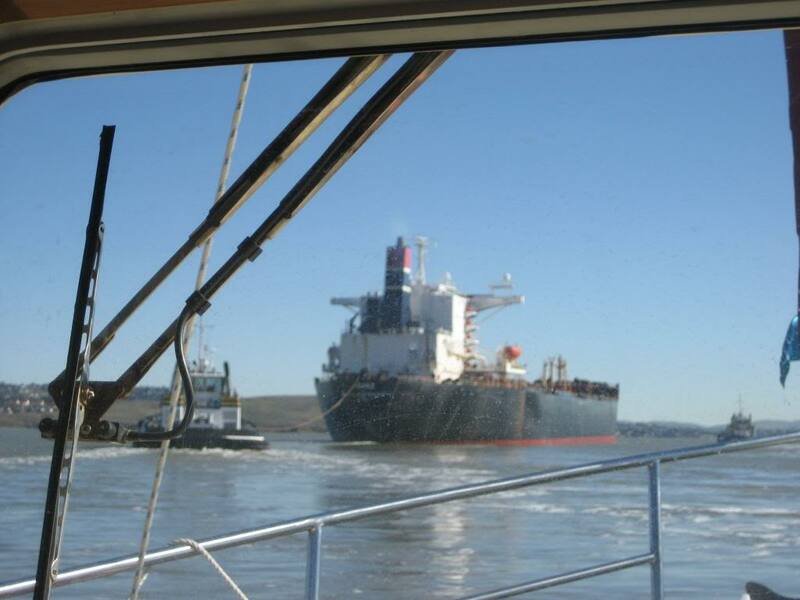 The prudent sailor passes behind the tanker. I envision a law suit from the big ship owners, ala Rodney Dangerfield in "Caddy Shack" - "Hey, you scratched my anchor!!!!" Well, it is pretty clear what most likely happened (stupid in the extreme although it was). The sailboat gauged his speed and figured that he could make it, without taking into consideration that the big ship would steal his wind. Look as if he lived to sail another day, so he needs to count his blessings. From the square set of spinnakers on several sailboats running before the wind and passing by the ship, ship`s bow seems to be into the breeze, suggesting the boat involved was not blanketed. Silly miscalculation, inevitable result. luffing is a term I usually don't use. The first thing you have to look for in these situations is how many sailboat- sized dents are on the bow area of the ship . . . . This happens frequently in his area!! Busy waterway with commercial ships, naval vessels, and very large commercial tankers, freighters and much smaller sailing vessels. Back in the day our RN minesweeper picked survivors out of the water when a sailboat crossed the path of a tanker running into the Fawley refinery, in this same area. As stated in other threads, always get out of the way of big ships, no matter who is "stand-on" vessel. They may not see you, probably are unable to do anything about you, and may care less!! I had a work contract for one of the large media corporations covering Cowes week during the 80's, it was like the America's cup x 10 sharing one of the busiest waterways in Europe, probably the world. Imagine the skippers reaction looking up at that bow, no more than 100' ahead, bearing down on you at 20 odd knots. A very lucky skipper I think.